This is my little homepage museum. Have fun looking through my old homepages. 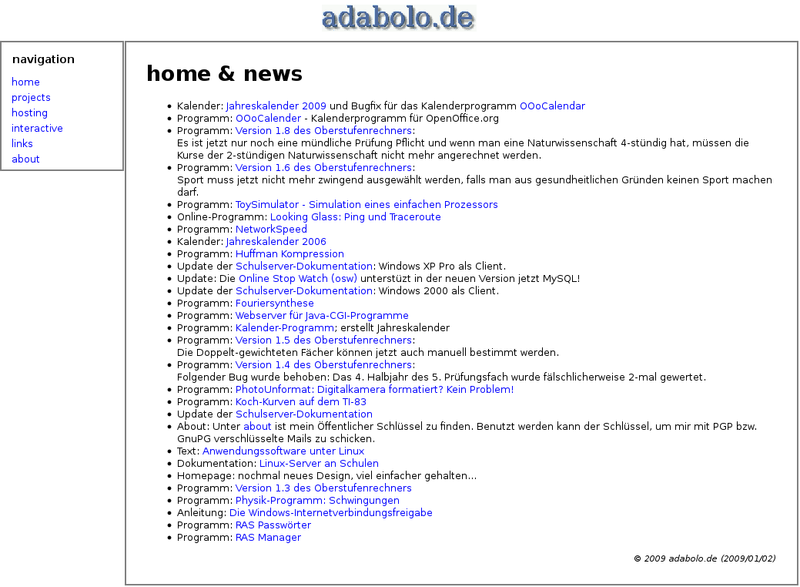 2013-08-07: This was may old homepage available until August 2013 under the domain "adabolo.de". This now uses no frames anymore, but the layout looks like it does. This homepage collected even more content. The last update however was in 2009. 2004-03-17: Still using frames but much simplified. The same content, just a little bit more. 2003-04-10: This is another version of my homepage for which I have no own backup. 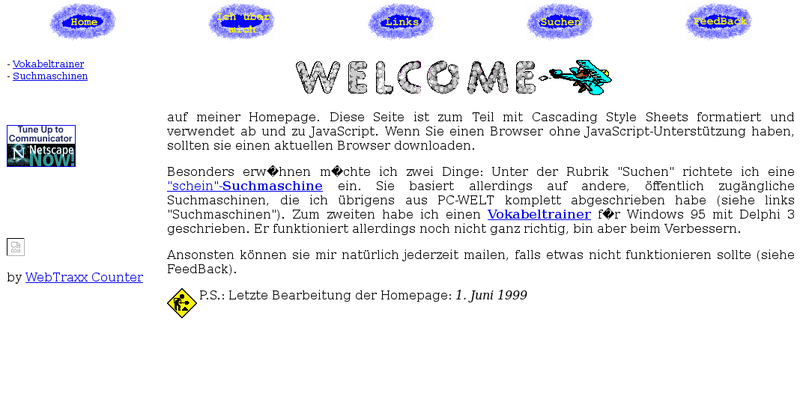 This homepage was once available under "www.ada-net.de", a free domain financed by ads. 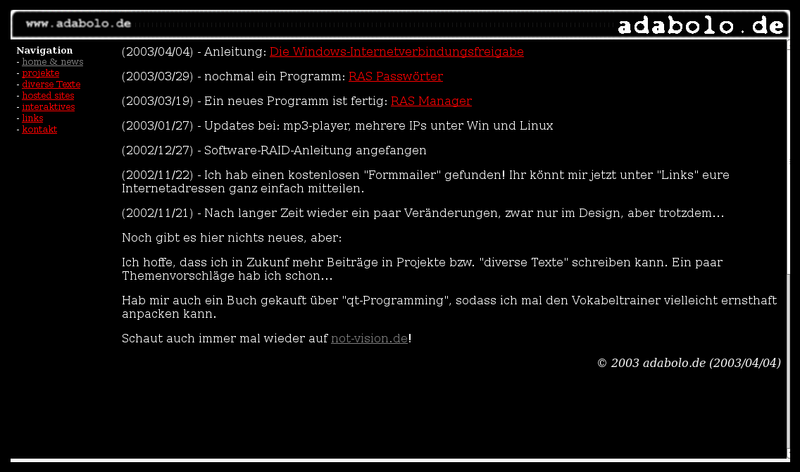 The original web archive start url I used was: http://web.archive.org/web/20030410111754/http://www.ada-net.de/. 2002-06-08: Interestingly, I didn't have an own backup of this version of my homepage. But luckily, the internet web archive created an almost complete backup which I copied here. 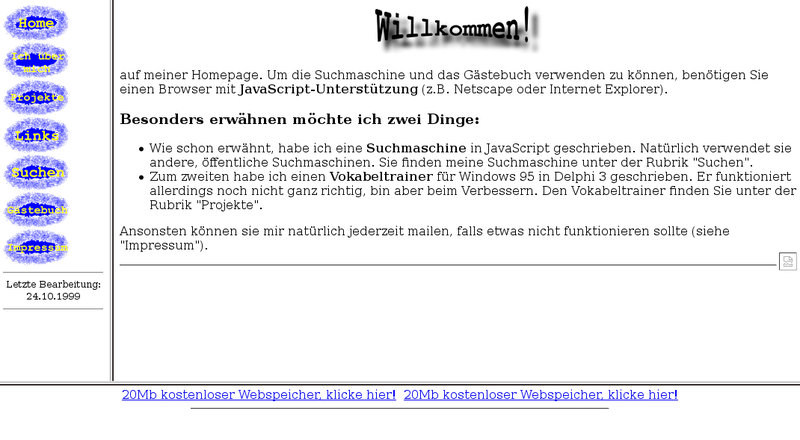 The start URL on the web archive I used was this: http://web.archive.org/web/20020608153018/http://www.adabolo.de/. 2001-06-23: I left the frames now behind. But if you look at the next homepages - it was only a short period. 2000-08-24: After having used white background for a while, there was time to change. Interesting is, that I switched back from XHTML to plain HTML4, as older browsers seem have had problems with XHTML. 2000-05-02: In the year 2000 I changed again the hosting provider. 1&1 offered at that time free hosting under the name "purespace" including a own subdomain: www.ada.purespace.de. 1999-10-24: I seem to have discovered "fortunecity" - a free webhoster at that time. And another feature of HTML: My homepage uses now frames. 1999-06-01: This seems to be my first homepage, at least, I didn't find any earlier one. Back in 1999, the charset was not yet UTF-8. And it seems, I liked animated gif pictures. And a visitor's counter was also obligatory. I guess, it was hosted by t-online. And it seems, there was no index.html, but either a "page.htm" or "homepage.htm".